I am going to go ahead and tell you that the photos do not do these bars justice. Partially because I tried to take photos when it was half dark outside, and also because these Trillionaire’s Shortbread Bars are just too good. Let me tell you how these bars came into existence. One day, one of my coworkers gave me a recipe for Billionaire’s Shortbread Bars from Food and Wine. She mentioned something about the difference between Millionaire’s Shortbread Bars and Billionaire’s Shortbread Bars. So I did some research, but didn’t find much other than sometimes Billionaire’s have peanut butter stirred into the caramel. Now, I’m not complaining about peanut butter caramel, but I was hoping for more of a difference. Enter Trillionaire’s Shortbread Bars. Chocolate everything. 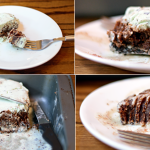 These triple chocolate bars start with a super easy chocolate shortbread layer that comes together easily in a food processor. If you don’t have a food processor, you can certainly use a pastry cutter or two knives to cut the butter into the dry ingredients instead. Next is the caramel layer. I definitely don’t have caramel-making down, but this was pretty easy. After the sugar has turned pretty and golden-brown, remove the saucepan from heat and stir in 1/4 cup chocolate chips. This chocolate caramel is possibly the best part of these bars. I’m kind of sad I didn’t think to put some bourbon in it. 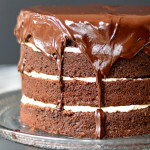 The ganache layer is also super easy. You just have to chill the pan between each layer, then pour on the next one. Obviously I’m bad at cutting things into squares, but these photos just don’t do the bars justice. When you bite into one, the ganache is soft, the caramel has a little chew, and the shortbread layer is crisp and has a good snap. It’s totally addicting. 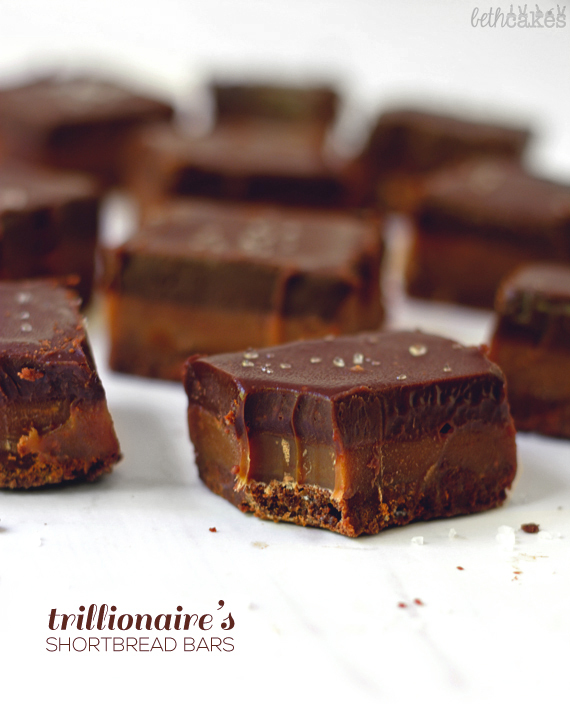 And that’s why Trillionaire’s Shortbread Bars > Billionaire’s Shortbread Bars. Combine all of the ingredients in a food processor and pulse until everything is combined and a dough has formed. Press the dough into the prepared pan. Bake for about 25 minutes. Let the shortbread cool completely. In a small saucepan, melt the butter with the cream and salt over medium heat. Once melted, keep the cream mixture warm by reducing heat to very low. In another medium saucepan, combine sugar and water and cook over medium-high heat, swirling without stirring, until a golden caramel forms, about 7-10 minutes. 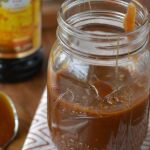 Carefully drizzle the warm cream mixture into the caramel mixture, stirring constantly, until the temperature reaches 230° on a candy thermometer, about 3 to 5 minutes. Immediately pour the caramel over the cooled shortbread and let cool completely, about 45 minutes. You can speed up this process by putting the pan in the refrigerator. Put the chocolate chips in a heat-proof bowl and set aside. In a small saucepan over medium heat, bring the cream to a simmer. Remove from heat and pour cream over chocolate chips. Let it stand for about 5 minutes. Stir together the cream and chocolates until there are no lumps and ganache is smooth. 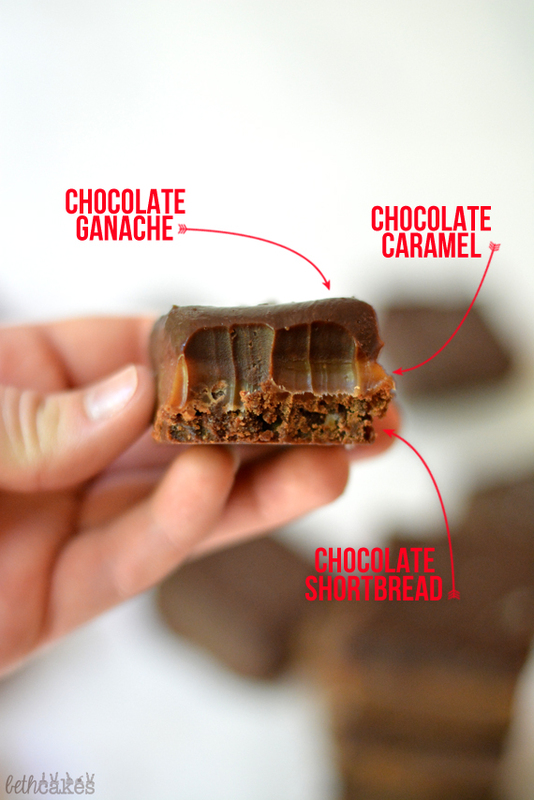 Immediately pour ganache over the caramel layer. Let it set for a few minutes, then sprinkle with sea salt. To serve, lift bars out of the pan by the foil overhang, and cut into squares or bars. Enjoy! All images and content are copyright protected. Please do not use my images without permission. If you would like to republish this recipe, please re-write the recipe in your own words, or link back to this post for the recipe. Thank you. AND, I’m super excited to be announcing that this is the first-ever bethcakes giveaway! 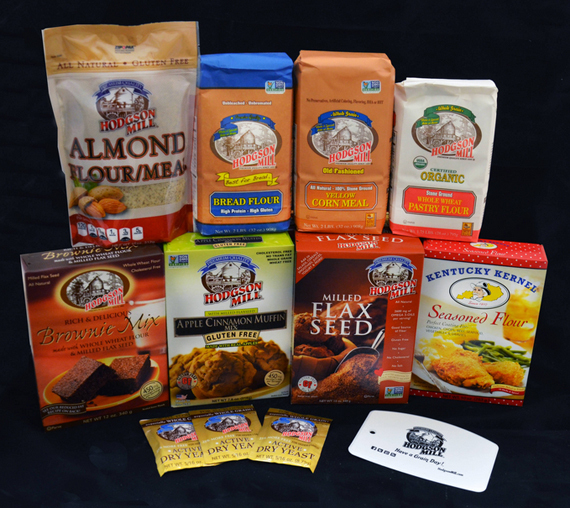 I’m teaming up with some of my other favorite bloggers and the wonderful people of Hodgson Mills to give one lucky winner a Hodgson Mills Prize Pack! That’s a lot of good stuff, so enter the giveaway by using the Rafflecopter form below! 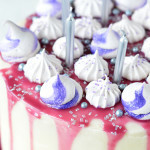 Oooooh these look divine! Awesome giveaway too! Uhmmmm…these are perfect!! Trillionaire all the way. Chocolate and caramel is my weakness and I should not be left close to these bars. Amazing giveaway, and these Trillionaire Bars are ridiculous in the best possible way! Love how much you jacked up the chocolate presence 🙂 yummy! Pinned!! I think you did an excellent job on the pictures! I’m definitely sold. Did you say trillionarie? 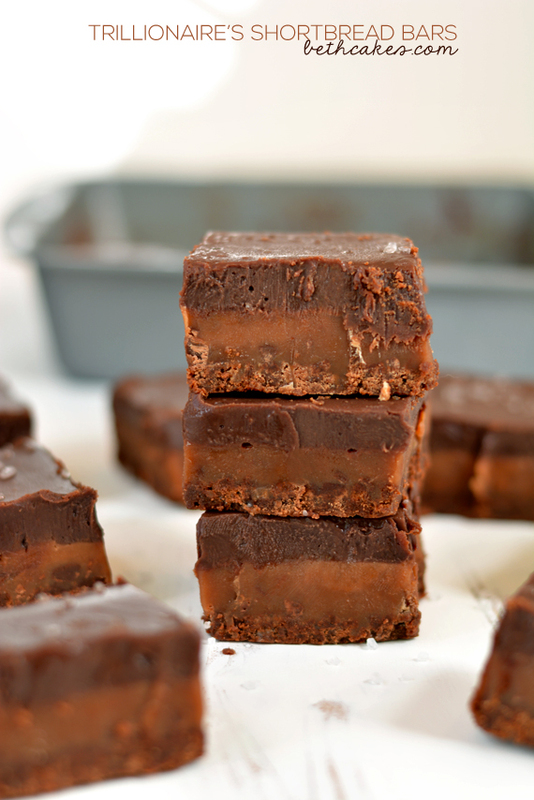 Chocolate and caramel layered on top of that chocolate shortbread is perfection! We still have about six of these in the refrigerator – oops, make that five. THESE ARE AWESOME, decadent (I am trying to think of a more over-the-top word to describe these). Good, good, good. I need to stop before there are just four left. 🙂 Don’t underestimate the sea salt garnish. It makes for a nice twist on the heavenly chocolate/caramel flavor. To die for, that is all. Beth, these look incredible! I have only ever done vanilla shortbread with caramel and chocolate — this is genius! These are great photos, especially if it was half-dark when you shot these! 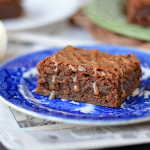 These look fantastic- I love the addition of chocolate to the caramel! LOVE the shortbread. We have a wonderful family recipe for millionaires shortbread, but it’s a great idea to make it super-chocolaty … pinning! They look absolutely delicious! One question about the recipe – are the chocolate chips missing from the chocolate caramel ingredient list and directions? Thanks! These trillionaires bars sound amazing, Beth! Trillionaires – I love it!! These look so rich and delicious – I want a bite right now!! 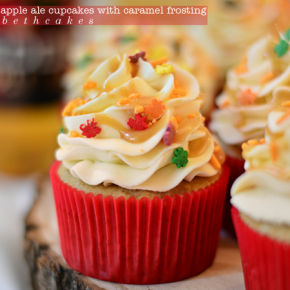 These look amazing, Beth! I am dying to sink my teeth into one! Oh my freaking goodness Beth…. these look and sound AMAZING! Like, I kind of want to take a half day from work and run home and make these immediately! Wow wow wow… pinning! Wow — that is a LOT of chocolatey goodness! 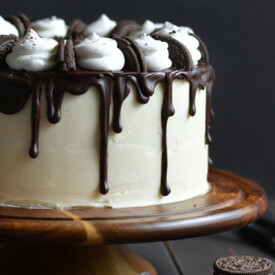 Love how thick and gooey the caramel and ganache layers look. This is definitely a must-try! These are absolutely incredible!!!! Seriously, nothing sounds better to me right now and it’s hard to imagine that the pictures don’t do them justice. So great! Oh my lord, these look unreal! Hi Beth! I’m so excited to find your blog! We are having family over for the 4th of July week and I’m trying to find some good recipes – Jackpot! I will be making these bars for sure! These look amazing! Can they be made ahead of time and frozen for an event in a week?